Yes, having already lost a small child has made a huge difference in my stamina at the gym. I didn't start going to the gym this year (even though it was a new years revolution) until this month - April Fools day to be exact - but I've never felt better while at the gym than I do now. My pace is much faster than it's ever been and I'm able to go longer than I would have previously. Pretty exciting stuff for a fat guy. Today I decided that I was going to shoot for an hour even if I had to keep a slower pace than I have been doing lately. Good news is that I hit the hour. 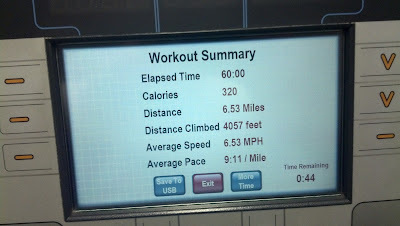 Better news is that I kept up a pace over 6 mph for at least the first 45 minutes. Those last 15 minutes were up and down as I was getting tired. The last 5 minutes were all at about 4.2-4.5 MPH. The only negative about the photo below is that for whatever reason the computer didn't accept my answer when I put in my weight at the beginning. Somewhere around the half way mark I noticed it wasn't tracking my calories so I had to re-enter my weight for it to begin. 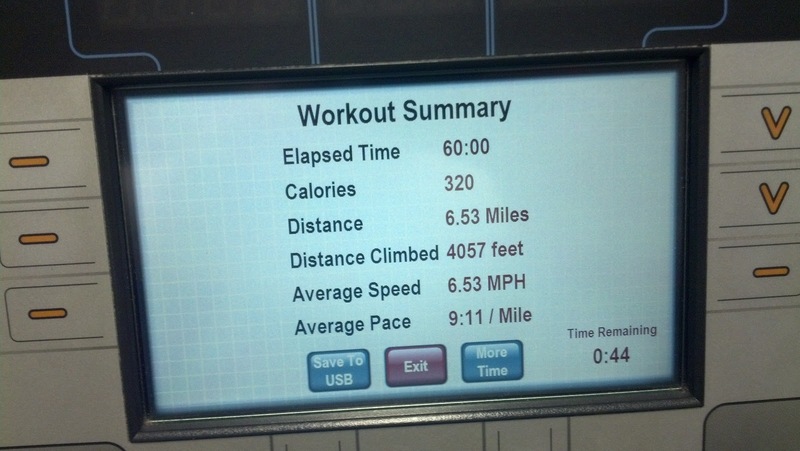 So, lets just assume somewhere around 600 calories burned. Burning babies off your body. Frightening, yet awesome.